Arsenal Newspaper feeds you with Arsenal news from top football news sites like Arsenal.com, ESPN, SkySports, DailAy Mail, and Metro. Injury News, Transfer News, Lineups can be found here. 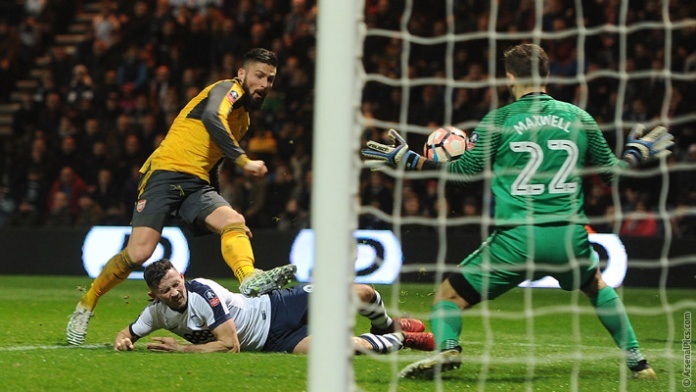 Arsenal have progressed to the fourth round of the FA Cup after securing a 2-1 victory over Preston North End. The Gunners were trailing by a goal as early as the seventh minute, courtesy a strike from Callum Robinson which made Deepdale go crazy. Perez was close to an equaliser on two occasions - one from a shot from the edge of the box and another via a header but none of these was able to alter the result at halftime. Aaron Ramsey put the visitors on level terms with a shot into the top corner immediately after the break. That was his first goal for Arsenal this season. Arsenal then sent another goal into the net. Unfortunately, it was disallowed since Giroud scored from an offside position. Olivier Giroud then made sure we do not get a replay. This he did very late in the match by slotting home from close range. It was a memorable night for the Arsenal. The victory maintained Arsene Wenger's record. He has never lost an FA Cup third round tie ever since he became Arsenal manager.